The Baby Collection - Michelle’s Craft Basket - Gifts, Favors, Accessories and More! It's never too soon for feathers! This inter-changeable hair pretty is perfect for your little angel, both before her beautiful curls come in and after! Can be worn as a headband, or as a barrette, for two distinct, adorable looks! Send your princess out in style with this personalized onsie and matching hair pretty. Hair pretty is a headband, for pre-hair, and can also be a barrette for when all those lovely locks come in! I took close up shots of the Baby Collection, but realized that it was hard to tell the size of the hair accessories. So, I put them next to this can of Dr. Pepper for a frame of reference. The bows are attached to the tiny, baby "claw" clips. 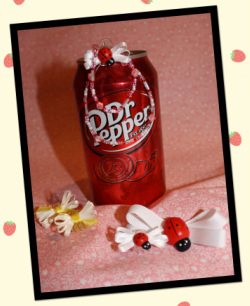 Your baby will love these adorable Ladybug bows, which are perfect for holding those first ponytails, clipping back bangs, or adding as a decoration to pony or pigtails that are already big enough for a rubber band! Mom's Ladybug Hair Bow is on a metal, clip barrette, covered in a matching white ribbon. Baby gets two Ladybug bows on small "claw" clips, which are great for first ponies! Your baby will love these adorable white bows, on yellow clips with yellow accents, which are perfect for holding those first ponytails, clipping back bangs, or adding as a decoration to pony or pigtails that are already big enough for a rubber band!